In recent years, there has been increasing implementation of group and team decision-making within organizations, much of it managed electronically, between members of what are "virtual" groups or teams. Recent research into effective team implementation emphasizes "trust" as an intermediary process, and trust must be a part of any account of team decision-making. This book provides an integrated framework that represents process in decision-making by interactive groups and teams. This framework furthers both our understanding of process and our capabilities in implementation, based on an account of group decision-making that differentiates the information types contributing to decision quality and relates them to process in interactive groups and teams. 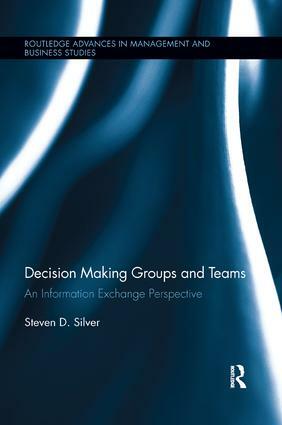 Author Steve Silver emphasizes the social structure that is inherent in the interaction of decision-makers as group or team members and effects on the information they exchange.